5/8" Barbed oil drain (return) flange adapter for the Ford EcoBoost 2.3L engine (bolts to the 2 bolt flange on the engine). Compatible with 2015+ Ford Mustang EcoBoost 2.3L. 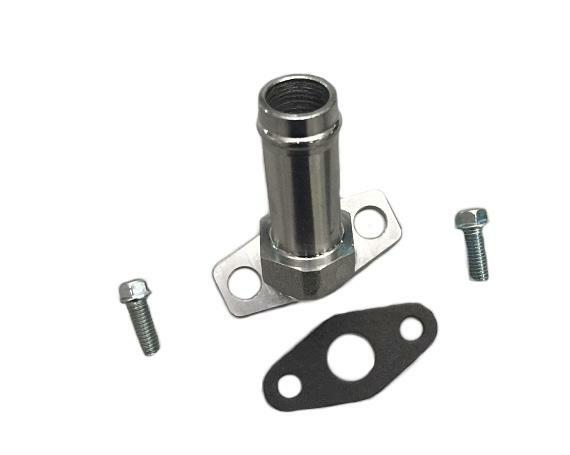 The 5/8" barbed oil drain flange (return) adapter is an excellent solution to install a 5/8" inner diameter oil drain (return) line for a custom upgrade turbocharger to the Ford EcoBoost 2.3L engine. Simply, remove the existing oil drain (return) flange, bolt-on the new 5/8" flange adapter, and plumb a 5/8" inner diameter line to the custom turbocharger!